Based in Yorkshire, Struggle Events organise top quality cycling events around Yorkshire – as the name suggests, though the scenery is beautiful, the rides are definitely a struggle to challenge riders. We provide our pork pies for their sportives to encourage cyclists through the last of the brutal climbs. How did you start cycling have you always loved competitive cycling? I have been cycling almost as long as I’ve been walking. My Dad is the chairman of the Essex cycling club, Glendene CC. I grew up learning my craft on the club runs and touring weekends until I was old enough to race – and I’ve been racing ever since. I am now a DS for a local team and my passion is to give back to the sport I love through both the team and the cycling events I deliver with Struggle Events. I love being in the wheels; whether it’s in a race, on the local chain gang or out with a group of lads on a Saturday training ride. Let’s talk pork pies…what makes them perfect for you? They are perfect just as they are; straight out of the packet and into the hungry mouth of a cyclist. I remember many times when I’ve been out on a long, cold winter training ride into the Yorkshire Dales and after sugary flapjack washed down with sweet energy products all I crave is a savoury pork pie. We get 5 star reviews from our riders and each one mentions the Vale of Mowbray pork pies in their write-up. One even said they behold “life-saving properties”. 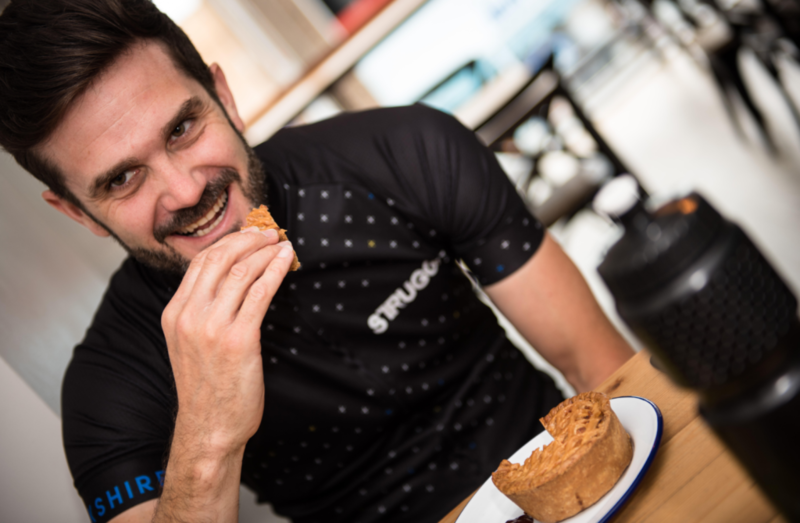 Although our feed stations are stocked up with optimal sports nutrition – giving riders what they need when they need it most – the pork pies at the final feed are a savoury treat that the body really does crave after 100 hilly miles. What’s your favourite flavour of pork pie? I’m a traditional man so I’ll have to be boring and say a simple pork pie – no fillings or flavours necessary. Top tip for amateur cyclists? Ensure you eat a mouthful of food every 30 minutes while out on the bike to keep your energy levels up. Always sip a good carbohydrate energy drink in your water bottle. I recommend OTE Sports energy powder. Never leave home without some emergency food – like a pork pie or and energy gel – in your back pocket. Top recovery tips post race/ Struggle? You have a 20-30 minute fuelling window post-ride to take on protein for optimal recovery. A pork pie is ideal because it also contains carbs, which your body needs to absorb the protein and replenish your glycogen stores. Who can enter the Struggle? What’s your top training tip for those looking to enter the Struggle? With prior training, any aspiring road cyclist can enter a Struggle event. Struggle Dales takes place on 26 May 2019 in the Yorkshire Dales and Struggle Moors takes place on 07 July 2019 in the North Yorkshire Moors. Whether you finish in 6 hours or 12 hours, you know you’ve achieved something epic when you cross the finish line on a Struggle Event. My top training tip is to embrace hills. Hunt them out and test yourself against the gradient. All our events end with a steep climb towards the end of the event, when riders have 100 tough miles in their legs. So finish your long training rides with a hill to get you used to climbing with tired legs.